Translation: completed French (Français) translation. Big thanks to Alex Goudeau and James Capra! Translation: completed Portuguese (Brazil) (Português do Brasil) translation. Big thanks to Ary F. Capra and James Capra! Translation: completed Hebrew (עִבְרִית) translation. Big thanks to Asaf Wolf! Translation: completed Finnish (Suomi) translation. Big thanks to Lassi A Liikkanen! Translation: added Ukrainian (Українська) translation. Big thanks to Sergey Galagan! Translation: added translation term Edit %s. Tip38 - Overhanging/Pull Quotes (style.css) (only in full width child themes) (via Resonar). Tip39 - Overhanging Images (style.css, js/custom-scripts.js) (only in full width child themes) (via Twenty Sixteen). Tip40 - Optional post thumbnail (Featured Image) on index views (style.css, inc/template-tags.php , template-parts/content.php) (can also be used in child themes) (via Twenty Sixteen). This option is enabled by default in a child theme example - too good to leave it disabled! See the image below. Tip41 - Display the optional entry excerpt (subtitle) below the entry title. It is implemented as in Twenty Sixteen. Includes a fix for better plugin compatibility. Tip85b - Add Social Links Menu to header (optional) (functions.php, style.css) (only in child themes). Tip89 - Add custom image sizes to the editor (functions.php) (also in child themes). Tip90 - Fine-tune Schema.org markup (inc/semantics.php). Added new file inc/semantics.php to and new functions and to collect all related functions from functions.php and template-tags.php. Enhancing microformats support and adding microformats v2 support (via SemPress, link 2). Added to functions.php new functions, based on plugin Disable Emojis to improve site performance (disabled by default) (only in child themes). Added new social network icons for odnoklassniki.ru and getpocket.com. Added new HTML5 input types to the comment-form (via SemPress). Added for the Fancy Header child theme CSS rules to relocate the whole branding block to the left side, search style.css for: "Move the branding block to the left side". Indicate widget sidebars can use selective refresh in the Customizer (via Twenty Twelve). Tip02 - Optional code to enable favicon for the website, admin area and login page. It was done, because now Site Icon can be set in WordPress. Removed non-standard and deprecated webkit CSS rule word-break: break-word that also caused some problems (ticket) on Arabic RTL sites. Removed some functions from parent theme's functions.php that were disabled by default. Removed itemscope="itemscope" itemtype="https://schema.org/WPHeader" from the div.site-branding as it was duplicate from header. I'm not sure why I did this way before. Changed the global value in functions.php for content_width 640 -> 625 because that is current content width, I guess the old value came from the Twenty Twelve theme where sidebar was narrower. Fixed Schema.org issue placing "name" inside "Person". Escaped attribute text properly in aria-label attributes (via Twenty Sixteen). Fixed menu bug where menu would be incorrectly rendered when enlarging browser window with expanded mobile menu. To fix this, additional media query was introduced: @media screen and (max-width: 782px). If you're using a child theme, please see Child theme example that is included with the main theme, to see what changes you have to make in style.css. Fixed a bunch of small CSS errors. Fixed function tinyframework_tax_body_class that was not adding category names to a post BODY classes. Added conditional for tinyframework_page_slug_body_class function, so the post/page slug would not be added to category and other archive pages. Enabled touch support for nav menu links with sub-items (via Underscores, pull). Dependency update: updated normalize.css to 4.2.0. Dependency update: updated Font Awesome 4.3.0 --> 4.6.3. Dependency update: updated related CSS styles to Bootstrap 3.3.7. IMPORTANT! 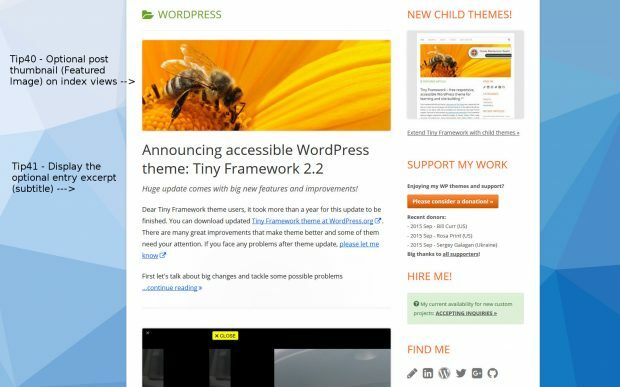 Enhancement: I had to change the theme text domain tinyframework --> tiny-framework. If you are using a child theme in another language, you need to check child theme's files and replace all tinyframework text domain instances with tiny-framework in order for the translated lines to appear. I understand that this change may cause problems to some users, but WordPress.org theme review team basically forced me to do this. Enhancement: additional functions were added to template-tags.php to deal with the Site Logo migration to WP Custom Logo. See the section "Temporary and deprecated functions" at the end of the file. Enhancement: made function tinyframework_the_site_logo replaceable in a child theme. Enhancement: Custom Logo Optimisation. Bring custom-logo args closer to custom-header (link 1, link 2). Enhancement: reverted some changes in editor-style.css (via Twenty Fifteen). Enhancement: updated h2.entry-title code in content.php adding esc_url (via Underscores). Enhancement: updated comparisons to resolve the strict comparison warnings (via Underscores). Enhancement: removed unnecessary value passed to get_categories() in tinyframework_categorized_blog() - template-tags.php (via Twenty Sixteen). Enhancement: don't include pingback unnecessarily (via Twenty Sixteen). Enhancement: unified word-break and word-wrap rules. Enhancement: changed font-weight values from 700 to bold to make the code more readable. Enhancement: improved selector for mailto links (via Twenty Sixteen). Enhancement: removed some unnecessary browser specific CSS prefixes (via html5please.com). Enhancement: improved bottom margin for .post-navigation links. This was especially visible in posts with disabled comments. Enhancement: many Schema.org integration improvements. Enhancement: changed the class for Sidebar from .secondary --> .sidebar, as Sidebar already has ID #secondary (via Twenty Sixteen). Enhancement: removed hfeed class from singular pages (via Underscores, Twenty Sixteen). Enhancement: respect content-search.php for search result in Jetpack Infinite Scroll (via Underscores). Enhancement: set a fixed table-layout in the clearfix to avoid max-width conflict (via Underscores). Enhancement: repositioned the window on jump-to-anchor to account for admin bar and border height (via Twenty Sixteen). Enhancement: updated formatting of the_title with H2 (via Underscores). Enhancement: added styles for all HTML5 input types (via Underscores). Enhancement: Prevent fieldset elements overflowing on small screens (via Twenty Sixteen). Enhancement: updated navigation.js and skip-link-focus-fix.js (via Underscores). Enhancement: improved mobile menu - menu item now shows special icon if it contains submenu. Enhancement: improved menu in Full width child theme by positioning submenus on the left side this way preventing submenu items being hidden behind the viewport. Enhancement: assigned a zoom-in cursor icon for linked post images. Enhancement: use selective refresh to preview changes to Site Title and tagline (Site Description). Fixes issue where wptexturize and other filters fail to apply when previewing changes via postMessage transport (via Twenty Twelve). Enhancement: added itemprop="mainEntityOfPage" after post/page title for single pages/posts as link element. HTML5 specification says that link should be inside HEAD, but it looks that at the moment it is a workaround to pass Google's microdata validation. Update: replaced it with meta (and url as ID) as per Google recommendation. Update 2: appears that Google doesn't validate code based on its own example, reverting back to link element. Enhancement: back-compat.php was renamed to back-compat-wp-4-1.php. Enhancement: removed content-box box-sizing on search fields (via Underscores). Enhancement: added CSS rules to avoid overflowing wide custom logo in small screens in Firefox and IEs (via Twenty Sixteen). Enhancement: replaced http://schema.org links with https://schema.org. Enhancement: made tinyframework_categorized_blog pluggable (via Twenty Sixteen). Enhancement: consolidate styles for form field/textarea padding (via Underscores). Accessibility: improved edit_post_link function (via Underscores). Accessibility: updated "continue reading" functions (via Twenty Sixteen). Accessibility: reset word-wrap for screen-reader-text to ensure screen reader text is read as words and not affected by word-wrap (via Twenty Sixteen). Accessibility: do not show the outline on the skip link target container (via Underscores). 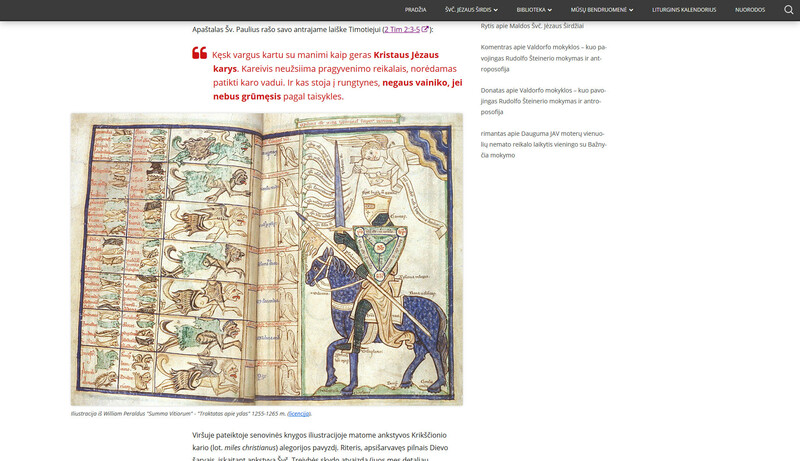 Accessibility: changed the article text from justified to left-aligned to improve accessibility for the dyslexic users. Accessibility: I take a little step back from the Site Title update in v2.0.3 and wrap Site Title on the Front Page in the link as it is on all other pages. That creates a page link to itself, but simplifies code in many places and mirrors Underscores theme. Accessibility: While upgrading Bootstrap 3.3.6 --> 3.3.7 it came to light that it is better to remove forced outline: thin dotted and leave it up to the browsers. Translation: updated Russian translation. Big thanks to Sergei Kasaurov! Translation: to improve i18n support, changed ...continue reading %s --> ...continue reading<span class="screen-reader-text"> "%s"</span> (via Twenty Sixteen, commit). Translation: to improve i18n support, changed Edit %s --> Edit<span class="screen-reader-text"> "%s"</span> (via Twenty Sixteen, commit). Translation: updated comments_popup_link function and translation. Translations of: 1 comment, % comments, etc. will be handled be WordPress (via Underscores). Translation: unified similar translations replacing Leave a reply --> Leave a comment in content.php.